Salivas are a group of flowering plants that are also referred to as sage. 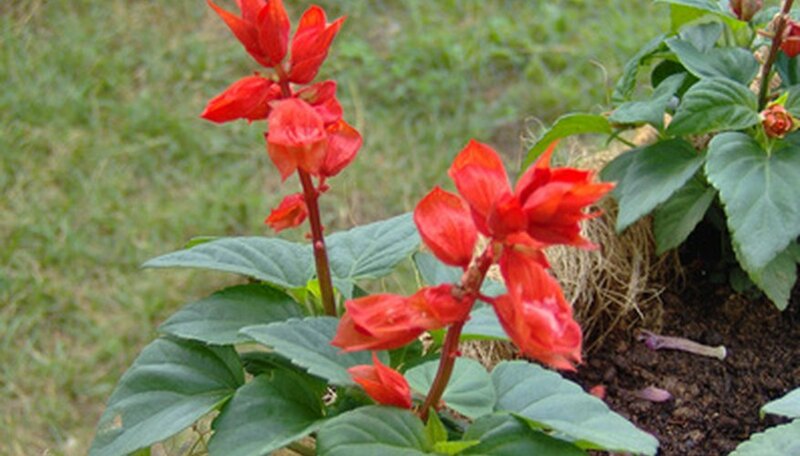 According to Clemson Cooperative Extension at Clemson University, the most commonly grown salvia is salvia splendens. It is a compact-growing salvia usually growing to between 1 and 2 feet tall. Salvia splendens is better known as scarlet sage since it commonly produces scarlet-red flowers, but it also comes in white, purple, orange, lavender and yellow. Fill up planting packs with a seed-starting planting mix until the cells are filled to within 1/4 inch from the top of the rim. Pack the soil down in each of the cells using the back of a metal spoon, or the blunt end of a pencil. Set the planting packs into a shallow watering tray or similar container that can hold about 2 inches of water. Let the seed-starting mix soak up the water until they are well-moistened. Place two to three salvia seeds into each of the cells in the planting packs. Push the salvia seeds into the surface of the seed-starting mix to ensure good soil-to-seed contact. Refrain from covering the salvia seeds with soil. Put the tray containing the planting packs near a light-filled window, but avoid direct sunlight. Keep the temperature between 65 and 70 degrees F. Keep the soil in the planting packs moist, but never sodden wet. Add water to the tray when required. Germination of salvia seeds will begin in approximately 10 to 14 days at the above conditions. Transplant the salvia seedlings when they are about 2 to 3 inches tall and after there is no more frost expected in your growing region. Choose a suitable location for planting the salvia seedlings. In cooler coastal areas, choose a site where it will provide full sun. For climates that are known for being dry and arid, choose a location that will provide some afternoon shade. Lay out a 1- to 2-inch layer of sphagnum peat moss, aged manure or dehydrated compost over the planting area. Work the organic matter into the soil using a garden fork or a shovel. The use of a soil amendment can help improve the soil and provide the salvia with soil that is fast-draining and fertile. Dig planting holes for the salvia seedlings that are the same size as the cells in the planting packs. Each of the planting holes should be between 12 and 16 inches apart. Pop out a salvia seedling from a cell in the planting pack. Use your thumb or index finger and push up from the base of the cell. Place a salvia seedling into one of the previously dug planting holes. Hold the salvia seedling level in the planting hole while you scoop soil in and around the seedling to fill the hole full of soil. Water each of the salvia seedlings with a starter solution fertilizer, such as 4-10-3. Follow the instruction on the product's label so you will know how much fertilizer to use per quart or gallon of water. Start salvia seeds indoors about six to eight weeks before the last expected spring frost in your growing region. See the resource section for information on frost dates.